Right-click on the download button and save the xml file to a directory of your choice, e.g your Quero installation folder. 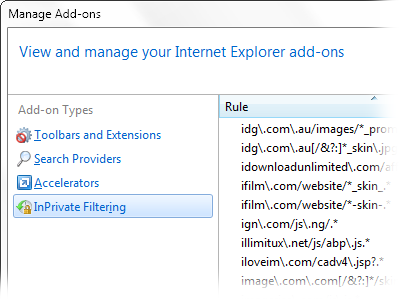 InPrivate Filtering XML-based Ad Blocker for Internet Explorer 8, based on the Adblock Plus EasyList. This method is an addition to Quero's Flash Hider and can be used without any add-ons. Download the xml file to your hard drive (e.g. to your Quero installation folder). InPrivate Filtering (also known as IE9 Tracking Protection) is Internet Explorer's built-in content filter and should not be confused with IE InPrivate Browsing, which basically turns the history and cookies off. There are two options for InPrivate Filtering: Automatically block and Choose content to block. The first also tries to block commonly downloaded third-party content by the means of a heuristic, whereas the second option only blocks the content specified in the xml file. I recommend using the latter option in order to not unintentionally break some third-party functionality. In order to get an even more effective filtering solution for IE, install the Quero Toolbar and use Quero's Flash blocker and content filter. You need to close all instances of IE for the setting to take effect.